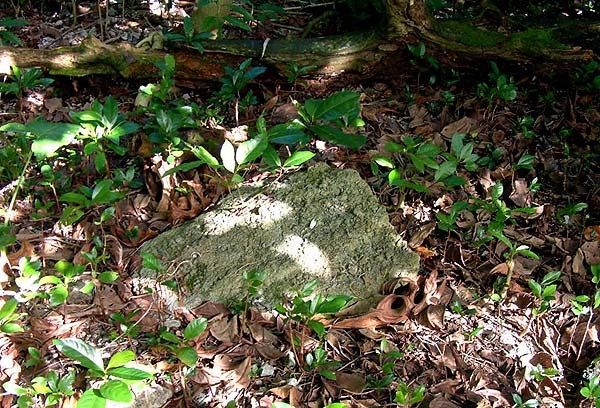 This stone marks the site of the Octopus Well. The well itself has been filled in, perhaps during the military occupation of Asor. "There is a well here on Asor and the well is called the Octopus well," Roke Wur recounts. "As the story begins, there was a lady on Soong. Soong is an island besides Pigl'eeal'ey, on the other side of the atoll—you know, all these islands were inhabited before. So there was this lady on Soong, and there was a well on Soong." "One day this lady came to the well to wash her baby’s clothes. And the baby was in a baby basket, the type that we used to see around here, for carrying babies. So she hung up this basket, this baby basket with the baby in it, on a branch by the edge of the well. So while the baby basket hung by the side of the well, she went to the well and washed his clothes. "When she got through washing, when she turned back, and she couldn’t find the basket or the baby. The basket with the baby had disappeared. She searched and searched and searched alongside the well, and in the bushes. And then finally she gave up searching at the well." 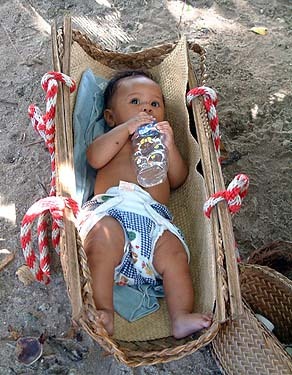 An Asor baby in the type of basket used in this story. Soong and Asor are on opposite sides of the lagoon. "She went back home and reported this to the people of Soong. So the villagers spread out throughout Soong. They couldn’t find any baby or any baby basket. They couldn’t find any evidence whatsoever of the baby basket or the baby. "And so the news was spread to Pigl'eeal'ey, which is the neighboring island of Soong, as well as the other closer islands to Soong. People started looking for the baby and the basket. They couldn’t find anything; they couldn’t find any baby or basket. "The news spread out further, all the way to the islands of Mogmog, and all through the islands of Falalop. People just searched and searched and searched. They couldn’t find the baby or the basket. The baby seemed to have just disappeared." "And so the search went on, but after so many tries, people just gave up the search. Then, at a later time—this was way after the search was called off—this baby basket just popped out, popped up to the surface of this well on Asor. So the people at the well who saw that baby basket pop up to the surface, they reported this to the people of Asor, asking whether that baby basket belonged to anyone or any family on Asor. The people of Asor came to check out the basket, and nobody seemed to know who the owner of the basket was. "And so the news spread out of Asor and went back, spreading to the other islands. ‘There is this basket that was found on the well on the Asor’." 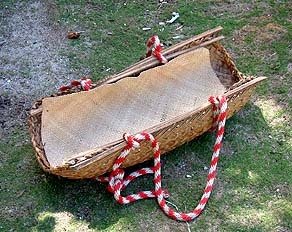 “Finally the news reached Soong because people from all over the islands, they came to check out the basket. ‘No, the basket doesn’t belong to us – we don’t know who is the owner of that basket.’ Finally this family on Soong, where the basket disappeared along with the baby in the basket, they came to Asor. "Immediately upon looking at the basket, the mother claimed that it was her basket, her baby’s basket. But there was no baby in the basket. And so her family claimed the basket, but they couldn’t find the baby. No one could come up with any trace of the baby, or any idea of how the baby just disappeared. Up to today, still nobody can say where the baby disappeared to." The basket popped up in the well on Asor, but no sign of the baby was ever found. Octopus. Photograph by Ethan Daniels, used with permission. “After that happened, that’s when people on Asor named that well, ‘Well of the Octopus.’ Now why did they name it ‘Well of the Octopus’? 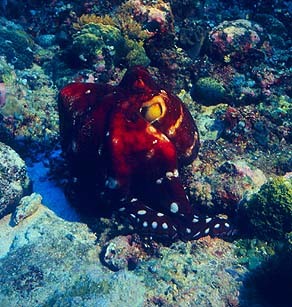 Because an octopus grabs things—fish or stones or whatever—and goes back into its hole. "So they thought, maybe an octopus was in that well then and it grabbed the baby and it went to the Underworld, which we believe is way at the very bottom of the well. “When I was young,” Mariano says, “if I was alone, I would not go to that well. But if there were some other kids, then we would just jump in and jump out of that well, because we’re afraid the octopus might take us down to the underworld." Another scary figure was a giant who lived on Mangeyang.